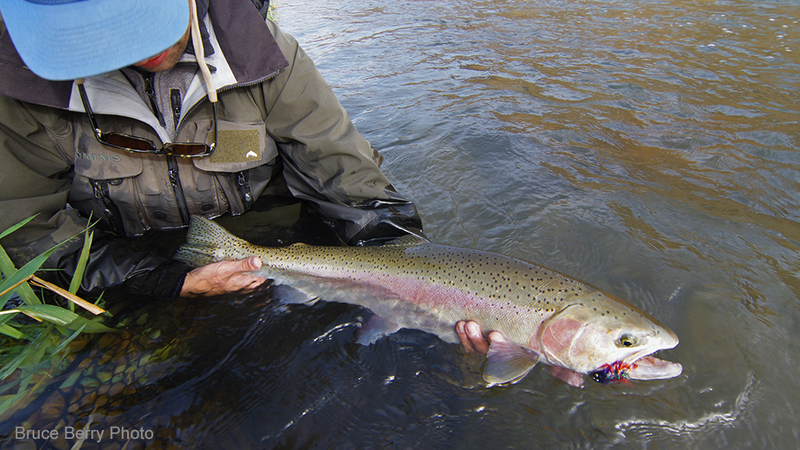 Berry's Fish Mover is an effective fly for steelhead that is offered in two colors: Orange and Blue. Orange is a fade of orange, red, purple and black designed originally for fish fresh into a system. This is the Fish Mover for bright sun and clear-water conditions, but it is also a killer for off-colored water. Blue is a fade of kingfisher, royal, navy and black designed as an anytime versatility color. This is the Fish Mover for low-light conditions. The name came from lurking around different fly fishing sites and reading about fisherman who would say anything except, "we did not catch anything today." "Moved a couple and had a head shaker" or 'Moved three fish, landed a trout and had a couple other suspicious pulls." It all means they had the chance to spend some time on the river and most likely without a cell phone, but, as fisherman, we rarely come clean. Fish that did get caught can often go from five to seven pounds from the boat ramp to the driveway. Being a fly-fisherman who chases anadromous fish means you are going to have OK days, great days, skunk days and periods of time measured in days without a pull, take, tug, tick, stall or anything that makes one wonder if they are casting downstream too far, not far enough, mending too much, not mending enough, tippet too long, tip too heavy, not heavy enough, that is just the way it is! The Fish Mover design came from a visit to Thailand to help train tyers specifically on steelhead fly proportions. Once a bunch of rhea quality ostrich was seen in the factory that nobody knew what to do with, "I had to create a fly with that stuff" said Bruce Berry of Montana Fly Company. The fluffy stuff is what trout tyers are looking for to create bugs like Ray Charles, etc. The skinny stuff is what steelheaders are after. The Fish Mover is a repeating process of Krystal chenille balls, strung saddle hackle and ostrich capped some rabbit fur (off the leather in a dubbing loop) collar. That way, the same length ostrich can be used and is spaced out between the chenille balls/hackle. This ultimately keeps the fly from clumping when it gets wet, allowing the movement of breathing and pulsing that makes the Fish Mover look alive and tantalizing in the water. And of course when I arrived back in Oregon and fished the prototypes they worked, but have since tweaked the proportions for more wiggle, which improved the fly's effectiveness, hence the improved version. This fly is on a shank, extended with wire and finished with medium dumbbell sparkle eyes. Fish Movers are pleasant to cast with two-hand rods of seven weights and larger. They sink fast and are designed to cover deeper water. Originally the fly was designed for middle of the road water conditions from some visibility to fairly good visibility. These conditions often find fish in classic tanks where losing flies is not really an issue or 35'-60' casts where the slot being fished is "x" amount wide and "y" amount long and you want the fly to land, sink quickly and start fishing immediately. You find a lot of steelhead in these kinds of spots during winter. "The more time I spend fishing this fly the more I find uses for it. 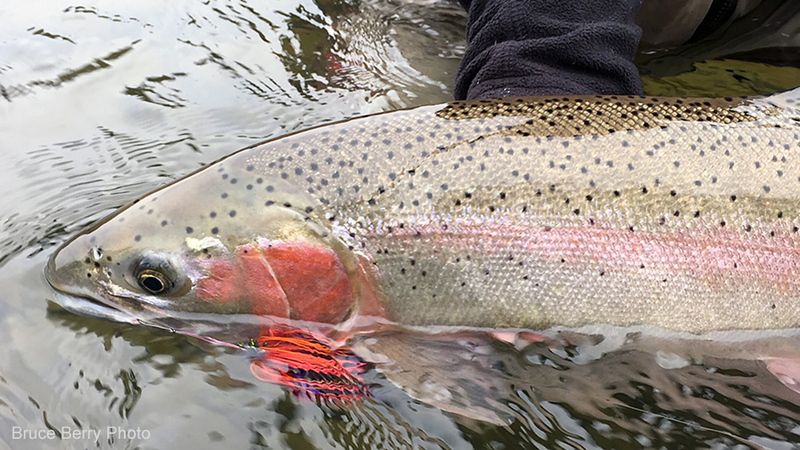 Tough summer conditions, late summer where you encounter quick water bumps coupled with quick temperature drops, and most winter conditions seems like fish just eat the fly. Heck, during late fall, I even use the big Orange Mover tied with bead chain eyes as a lighter version just as a follow up fly to make sure nobody was home after going through with a dry line wet fly combination when I get to fish known good pieces of water and don't want to leave for another spot just yet."